A project by Alessandro Capozzo and Katja Noppes. V'han fra queste contadine, / Cameriere, cittadine, / V'han contesse, baronesse, / Marchesine, principesse. / E v'han donne d'ogni grado, / D'ogni forma, d'ogni età. / Nella bionda egli ha l'usanza / Di lodar la gentilezza, / Nella bruna la costanza, / Nella bianca la dolcezza. / Vuol d'inverno la grassotta, / Vuol d'estate la magrotta / È la grande maestosa, / La piccina e ognor vezzosa. / Delle vecchie fa conquista / Pel piacer di porle in lista / Sua passion predominante / È la giovin principiante. / Non si picca se sia ricca, / Se sia brutta, se sia bella / Purché porti la gonnella, / Voi sapete quel che fa. Pretty lady, here's a list I would show you, / Of the fair ones my master has courted, / Here you'll find them all duly assorted, / In my writing, will't please you to look, / Here is Italy, six hundred and forty, / France is down for five hundred and twenty, / Only two hundred the Rhineland supplied him, / But mark the climax, Spain has already one thousand and three, / Here are Countesses in plenty. / Waitingmaids, nineteen or twenty. / Rustic beauties, Marchionesses, / Ev'ry grade his pow'r confesses. / Here are courtly dames and maidens, / Young and handsome, old and plain. / Is a maiden fair and slender, / He will praise her for modest sweetness, / Then the dark ones are so tender! / Lintwhite tresses shew discreetness; / When 'tis cold he likes her portly, / In the summer, slim and courtly, / Tall and haughty, ne'er she alarms him, / If she's tiny, no less she charms him. / Ripe duennas he engages, / That their names may grace these pages, / But what most he's bent on winning, / Is of youth the sweet beginning, / Poor or wealthy, wan or healthy, / Stately dame or modest beauty, / He to win them makes his duty, / And you know it, not in vain. Da Ponte - Mozart, Don Giovanni ossia Il dissoluto punito, 1787. 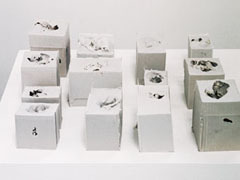 "Herz, il catalogo è questo" is a mixed media installation organized in a three modules rhythm: The first one introduces a heart cast made in traditional plaster, with the famous lyric by Da Ponte - Mozart written on. It continues with 13 heart casts, made of silicon rubber with talcum powder, installed as a city floor plan. 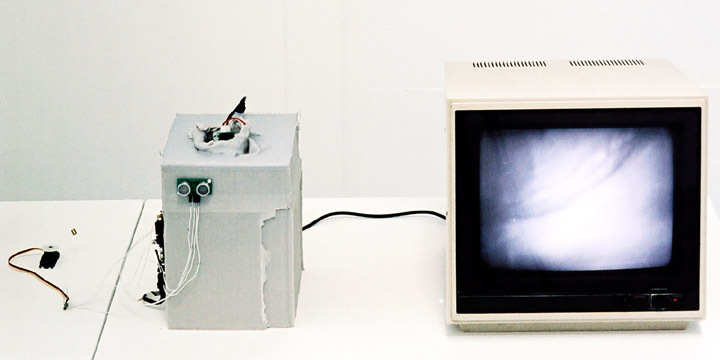 The third part is a another heart cast made of silicon rubber placed next to a monitor, a messy electronic circuit is openly installed on it. The system is driven by a microcontroller connected to an ultrasonic ranger sensor and a servomotor, a surveillance b/w camera (with a infrared lighting system built on) is set to take the heart inside view, the servo makes the camera moving with an heartbeat-like rhythm. increasing or decreasing the beat. Do hearts surfaces keep memories? 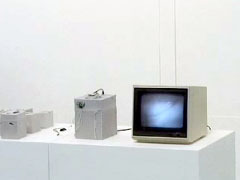 Alessandro Capozzo and Katja Noppes, "Herz, il catalogo è questo", 2006. Analog and digital mixed media. various cables and messy wires.